Can you believe that Christmas is only 3 days away?! I don't know about you, but for me it snuck up SOOO FAST this year. Thankfully, I was able to get my shopping done over this past weekend, and now I just have to concentrate on getting ready for our family Christmas party! This year as something different, we will be heading to my aunts house on Christmas day, and I decided to come up with a festive cocktail to bring for my aunts and cousins and I to sip on, while the little kids open their presents and run circles around us. Upon searching around a bit, I found a recipe for some gorgeous raspberry mojitos. To add a holiday twist, I decided to swap out the raspberries for cranberries, and they did not dissappoint! Here's what to do: 1) Add 10 fresh mint leaves, cranberries and 1/2 an ounce of white rum to each of your drinking glasses. Use muddler to muddle (ie, squish) mint and cranberries into rum. 2) Add a few pieces of ice and a lime wedge to each glass. 3) Add an additional ounce of the white rum to each glass. Measure out 2 tablespoons of simple syrup into each glass. You may need to add some more simple syrup once you have completed your cocktail, depending on how sweet you like it. 4) Fill the rest of the glass to the brim with club soda. Stir gently! 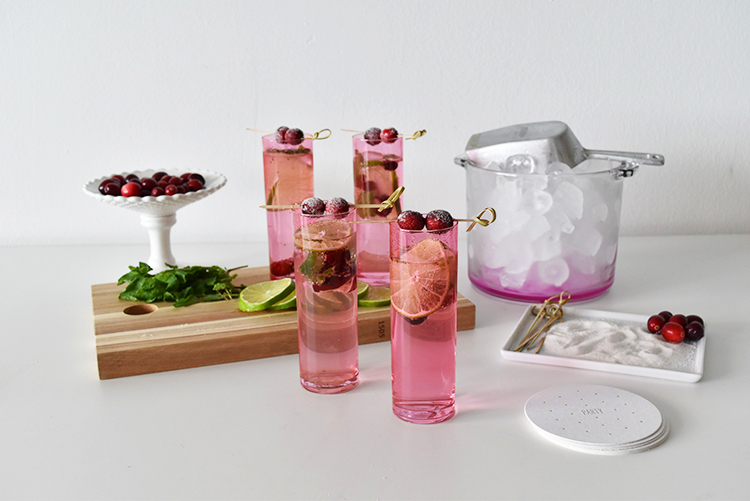 For an additional styling touch, you can garnish your glasses with a sugared cranberry cocktail stick! You can take your cocktail stick and spear 2-3 fresh cranberries. Use damp paper towel to dampen each cranberry, being careful not to make them too wet. Put a small amount of white sugar on a flat plate, and roll dampened cranberries through sugar, coating them. Stick cocktail stick on top of your drink! 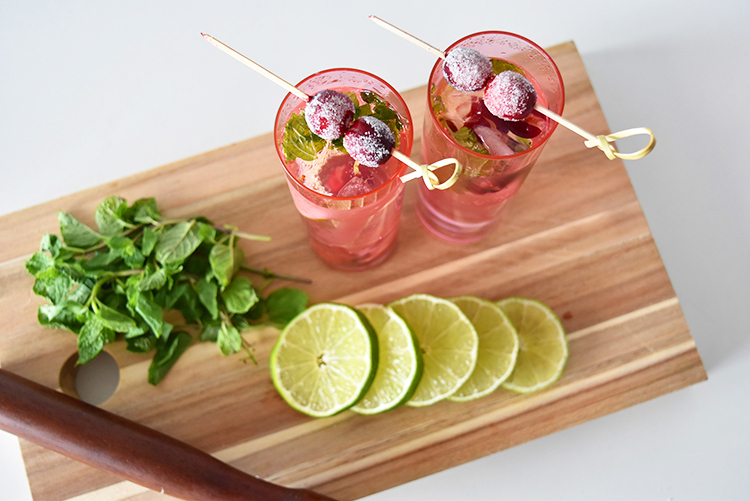 These cranberry mojitos were so delicious, and very easy to make! Plus, the red and green make them the perfect festive cocktail for your family to sip on while spending some quality time together on Christmas Day!